A burn injury involves significant physical pain caused because of damage to a person’s skin, yet the effects of serious burn injuries can be farther-reaching. Burn victims can require several rounds of follow-up care that involve intense rehabilitation and possibly additional surgery. Some people may also have a need for physical therapy to help them deal with their injuries. Severe burn injuries have the potential to cause lifelong disfigurement, and victims can also be forced to deal with numerous psychological issues caused by their injuries. Burn injuries are often the result of people being trapped in fires or other situations involving excess heat. Another party is often at fault for these types of accidents, and that party can be liable for the many damages caused by burn injuries. If you or your loved has suffered burn injuries in an accident caused by another party’s negligence in Virginia, act quickly to retain legal counsel. CHASENBOSCOLO understands the many challenges that burn victims faced in recovering from their injuries, and we provide compassionate, comprehensive assistance in obtaining compensation for medical bills, lost wages, and other damages. Our Virginia burn injury attorneys can provide an honest and thorough evaluation of your case. Call our office today at (703) 538-1138 or contact us online to set up a free consultation. Do I Need A Burn Injury Lawyer? After an accident that causes serious burn injuries, a victim can attempt to send a demand letter to the negligent party or their insurance company. The insurer’s response can often depend on several factors, namely the severity of your injuries and the value of your claim. In some cases, a representative from the insurance company may contact you and seem very friendly and concerned. They will then offer you the opportunity to make a recorded statement about your accident. We urge you, however, not to speak with a negligent’s party’s insurance company agent. These conversations are largely intended to get you to unknowingly make statements that ultimately damage your claim. In other cases, an insurer may come right out and offer you a lump sum settlement, which a representative may tell you is larger than that you would receive if having to pay a lawyer. Do not be misled, however, as the settlement you are being offered is probably far less than what you are entitled to. A knowledgeable and experienced Virginia attorney will handle such phone calls from insurance companies for you. CHASENBOSCOLO will fight to make sure that you get every dollar you are entitled to for your burn injuries. Our firm has helped thousands of clients recover hundreds of millions of dollars since our founding in 1986. 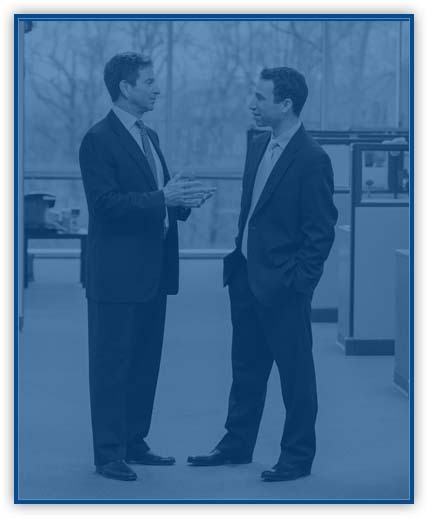 Each of our managing partners has over 30 years of legal experience. Attorneys Barry M. Chasen and Benjamin T. Boscolo have both received an AV Preeminent rating from Martindale-Hubbell, a peer rating denoting the highest level of professional excellence. CHASENBOSCOLO also offers our clients a No Fee Guarantee,® which means that you only pay when you receive a monetary award. Our firm will cover all legal fees and court filing costs, so you do not have to pay those expenses out of your own pocket. Our attorneys can fight to ensure that you receive the compensation you deserve, whether through litigation or an out-of-court settlement. The skin is the largest organ on the human body. The most common type of burn injury is generally a thermal burn, which involves contact with fire, hot liquid, hot objects, or steam. Other types of burn injuries are caused by contact with an electrical current or acidic chemicals, also known as alkali burns. Two other usually less serious categories of burns include friction burns, which are caused by skin rubbing against a coarse surface, and radiation burns usually caused by exposure to ultraviolet light (uv rays), ionizing radiation, or thermal radiation. First-Degree Burns — Damage to only the outer layer of the skin, the epidermis. Sunburn is a common example of a first-degree burn, and these usually heal in a matter of days. Second-Degree Burns — Damage to both the epidermis and the layer of skin below it, the dermis. Some second-degree burns can result in blistering and scarring, and these burns often take several weeks to heal. Third-Degree Burns — Damage to not only the epidermis and dermis, but also extending into underlying tissues and sweat glands. A third-degree burn always involves skin grafting, although additional surgery may be required in some cases. Additional categories reserved for catastrophic burn cases include fourth-degree burns, which extend into the fat layer, fifth-degree burns, which extend into the muscle, and sixth-degree burns which extend into bone. Insurance companies often seek to resolve most burn accident cases for a far smaller monetary award than what victims are entitled to. Their calculations rarely account for the significant pain and suffering that burn victims have endured. CHASENBOSCOLO will fight to ensure that you receive fair compensation for all of the ways your injuries have affected your life. What should you do when you suffer burn injuries? The first thing to do after any burn injury is to seek immediate medical attention. You should not wait to see if a burn worsens, as you want to receive the proper care as soon as possible to give yourself the best chance of recovery. You also want to have a medical record created right after your accident to avoid an insurance company taking an issue with any delay in treatment. Take pictures not only of your injuries but also of the accident scene. If any people saw your accident, ask them for their names and phone numbers in case they need to serve as witnesses. Lastly, do not discuss your accident with anybody or post about it on social media. Contact an attorney right away. How do doctors calculate burn size? In most cases, total body surface area (BSA) affected by a burn is calculated with a tool called the Wallace rule of nines, but more commonly referred to simply as the Rule of Nines. The Rule of Nines assigns different values to various areas of the body for adults and children, and a doctor simply adds the totals of the affected areas to estimate the BSA. The name for the tool stems from most body parts having 9 percent BSA damage, although the entire back or either leg accounts for 18 percent and the groin is 1 percent. A skin graft is an operation in which a piece of skin is transplanted onto a person’s body. There are several different kinds of skin grafts that involve different types of donors. An autologous graft (or autograph) is donor skin being taken from a different site on the victim’s body. An isograft (or syngraft) is from a donor genetically identical to the victim (e.g. an identical twin). Allogeneic or allografts are from donors of the same species. Xenogeneic, xenografts, or heterografts are from donors of a different species. A prosthetic graft replaces tissue with synthetic materials. According to the Virginia Department of Fire Programs, there were 23,443 fires in the state in 2017, resulting in aid being given in 44,706 cases. The fires resulted in 301 civilian fire injuries and 134 fire service injuries as well as 50 civilian fire deaths. These 2017 numbers were all the lowest totals of the past five years. In 2016, there were 28,771 fires resulting in 365 civilian fire injuries, 157 fire service injuries, and 80 civilian fire deaths. Fire departments in Virginia responded to an average of 1,866 incidents per day in 2017, and one civilian was killed or injured by fire in Virginia every 78 hours in 2016. According to the American Burn Association (ABA), 486,00 burn injuries required medical treatment and resulted in 40,000 hospitalizations in the United States in 2016. Three-quarters of the hospitalizations were at hospital burn centers. The ABA reported that more than 60 percent of acute hospitalizations related to burn injury were admitted to 128 burn centers, which average over 200 annual admissions. The other 4,500 acute care hospitals in the United States average less than three burn admissions annually. According to the Centers for Disease Control and Prevention (CDC), a person was injured in a fire every 23 minutes in the United States in 2000. The CDC also reported that up to 10,000 people die every year from burn-related infections. If you or your loved one have suffered severe burn injuries in an accident caused by another party’s negligence in Virginia, you will likely be dealing with an agonizing road to recovery. Fortunately, with the help of an experienced burn injury lawyer, you could get the justice and fair compensation that you need to pay your medical bills and focus on your recovery. CHASENBOSCOLO can step in and take the necessary steps to help you recover all of the compensation you are entitled to. Call (703) 538-1138 or contact us online today to schedule a free consultation.